I have somehow always understood that to have a relationship with my father I needed to meet him where he found interests. Yet, a halt sign warning, “Don’t Touch Dem Trains” barred my four siblings and me from his upstairs workshop, where he’d spent hours alone tinkering with locomotives, boxcars, track and trestles. Despite this prohibition, I wasn’t the slightest bit interested in trains. But I did find him in other places. Dad and I spent every summer of my childhood in his organic garden—a revolutionary approach in the 1960s. He called me his “shadow,” as I followed him around all day, pushing pole bean seeds into the warm soil with my tiny fingers or squatting down to hold steady his handmade paper rings as he carefully placed frail tomato plant seedlings within each one. He explained everything he did and answered any question I had in detail, but in a way that I could understand. Together we crushed Asparagus beetles between our thumbs and forefingers, both of us enjoying the snap and pop of their collapsing shells, the thought of which now makes me cringe. Today the loamy scent of fresh, warm soil turns over flashes of memory; my sneakers sinking into plush furrows while squinting up at the shadow of my Dad, in his straw hat, framed by the sun. My Dad and I also shared the “fix it” gene. In a family with three brothers, I became the motor head. He taught me how to extend the life of the exhaust system on my vintage Dodge Dart by clamping tennis cans pasted with heat sealant around the exhaust pipe. When my brake shoes needed changing, he handed me a Dodge Dart repair manual and some tools, and said, “Come get me if you have questions.” By tackling these repairs myself, I learned how to use hand tools and gained confidence in mechanical problem-solving. All these skills have become very useful on the “railroad”. While packing up my Dad’s collection I often found items without any labels or clues as to their origin. In the nursing home, I’d hand them to him one at a time. “Well now, this is a Pennsy 4-6-2 Pacific. I made it from a Bowser Kit that I bought in 1981,” he explained. “Uh…Dad, what’s a 4-6-2?” I asked. Ever the teacher, he responded with a question. 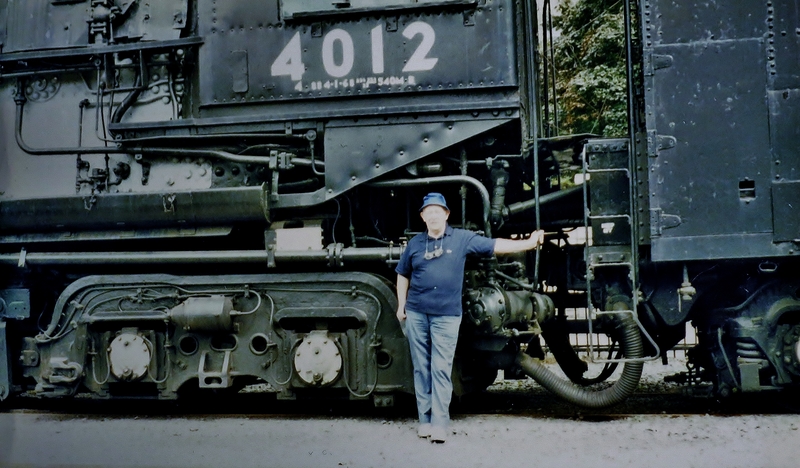 “How many wheels are on the front of the locomotive?” he asked. And so began my education in all things Model Railroad. Every week, we would both look forward to solving the bag of mysteries I’d bring. I learned about the different types of materials used in modeling, such as brass, die cast, plastic and something called zamac, an alloy with a base metal of zinc combined with aluminium, magnesium, and copper. Lessons followed on a variety of topics such as modeling gauges, (“HO is literally Half-O Gauge”), couplers and rolling stock, such as passenger, freight, and “Maintenance of Way” cars, which are the equipment used to maintain the railway. I was simply astonished that he’d had all this in the house, right under our noses. “Dad, you have so much stuff; how did you get it all in the house without Mom or us knowing?” I asked. His eyes squinted into smiles while he giggled, “I used to sneak them in through the garage.” And then we both burst out laughing.